UPDATE: Guests from National Review, might be interested in other Rabett Run competitions such as the current Tim Ball Award for Resume Stretching, featuring others from Morano's lists, and the S. Fred Award for Climatology Incoherence. Oh yeah, FWIW, someone who doesn't allow comments on their blog, shouldn't criticize others for their comment policy. Come on over and play Chris, but remember, there is a majic word. NSF gave some $ to the Congressional Research Foundation to evaluated Capital Web sites. Anyone who has walked past the place knows there are bats in the belfry aka the dome, but these guys decided to give Marc Morano's home base, the Senate Environment and Public Works Minority site, a Golden Mouse award. A “Fact of the Day” section and blog posts give them updated content and help ensure repeat visits to the site. The content is also fully integrated and cross-referenced throughout the site. The first one is really rich. Inhofe is beating on how good the Water Resources Development Act will be for Oklahoma. The bill, of course was vetoed by Bush, and overriden and passed in to law November 8. An example is the Water Resources Development Act of 2007, enacted Nov. 8. This critically important bill not only authorizes and modifies critical projects for waterways navigation, reduction of hurricane, storm and flood damage, and environmental restoration nationwide; it has a real and important impact here in Oklahoma. Communities across the state can benefit from authorizations such as those improving our lakes and waterways, for sewer improvements and for water-related infrastructure. In Oklahoma alone, the new law will result in savings of more than $10 million for the city of Edmond and $1.5 million for the communities surrounding the Waurika Conservancy District by clarifying disputes with the Corps of Engineers over water use. It will also continue projects at the Red River, which will enhance drinking water supply and agricultural irrigation in southwestern Oklahoma. In addition to the water development act, Congress should have reauthorized the Clean Water and Safe Drinking Water Act Revolving Loan Funds legislation I co-authored last year. It contained several provisions aimed at promoting water efficiency and new approaches to addressing supply shortages. Maybe if we put some CO2 capture systems into OK we could turn the guy. OTOH Marc is still getting his hand headed to him over at Dot Earth. Mus and Horatio are taking action. "As in all else, the mice over at the CRF seemingly have not RTFR." 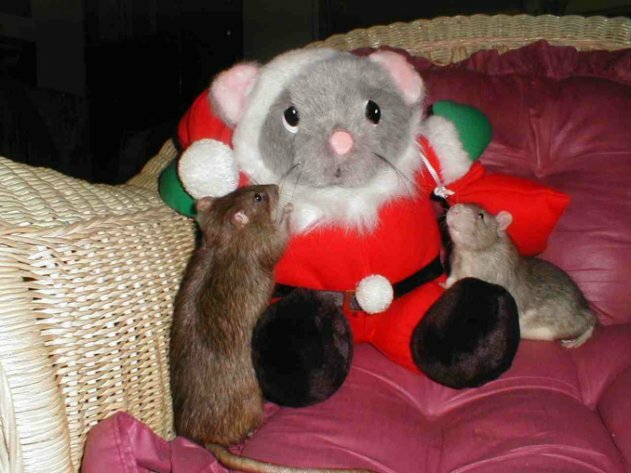 I believe they are rats, Eli, not mice. "anonyrats", but rats just the same. Mice can be mischievous but never malicious. In fact, this is what distinguishes the two species. And most mice do make an attempt to RTFP -- at least the ones who were educated in the mazes of universities. And they have learned to pee on TFP if they think it is crap. One more thing: if it smells like a rat, it most probably is one. We mice have know this for millions of years. ...which also makes for easy travel for us mice. I also got this in a lovely email from Morano. I was so disgusted I wrote to NSF. Okay, Roger Pielke Jr. is losing it over on his website. He's trying turn himself into a climate scientist by evaluating climate trends. It's all just ridiculous and humiliating for his university. He's also criticizing Hansen (again). But unfortunately for Roger, no one is paying any attention to his rantings any more. He's lucky if he gets any comments on his blog. Pielke has had his fifteen minutes of fame and now it's back to anemonimity like the rest of us. Eli thinks that the reason to blog is the community you can build. Roger let his ego get in the way, which is a big reason for doing this stuff pseudonyminously. A stuffed animal don't have much ego. A stuffed shirt is nothing but ego. Unfortunately this applies to both Piekes and a certain drama queen of our acquaintance. "A stuffed shirt is nothing but ego."